Over the course of the year I save up the bits of burr comb and brace comb that I remove from the hives. I collect the pieces in an old biscuit tin which has become part of my beekeeping kit, and each time the tin becomes full I transfer the comb fragments to a Pyrex bowl and melt them down over a pan of boiling water, then let the wax resolidify into solid blocks that are easier to store. By early winter this year I had accumulated a good bowlful of yellow wax, and was able to implement a plan that has been awaiting its moment for some time - the making of beeswax stars. I melted, filtered and remelted the wax many times to purify it, scraping away the speckled layer of darker impurities from the resolidified blocks each time. I poured the molten wax into silicone star moulds, let it cool, turned the stars out of their moulds, pushed a loop of wire through one of the points of each star, then threaded each star on to a red ribbon for hanging. 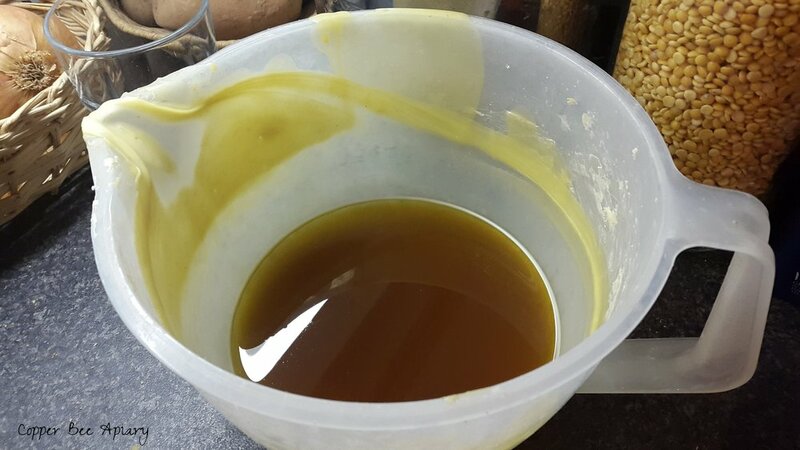 I also added essential oils - frankincense to one batch and sweet orange oil to another - simply shaking drops of the oil into the molten stars as they cooled in their moulds. The scents were largely lost to the overall scent of beeswax, but it felt Christmassy. Having been distributed as Christmas presents to family and colleagues, they are hopefully now adorning a selection of the best decorated Christmas trees and festive houses around the country!